The Others (2001), starring Nicole Kidman is a very good psychological horror movie with an impressive ending twist. In my point of view, horror movies that focus primarily on eeriness, uneasiness, and profound fear will fare much better than those that toy around with blood, gore, and physical pain. Different genre, I guess. But gore and horrible violence are never my cup of tea. 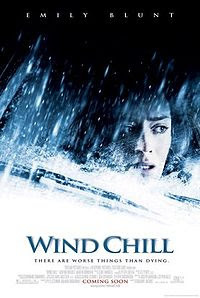 Wind Chill (2007), starring Emily Blunt is a rather slow-paced psychological horror movie with minimal paranormal elements. Well, not a bad movie to kill time though. LOL. You know what I mean, I hope. Dark Water (2005), starring Jennifer Connelly and cute Perla Haney-Jardine is a remake of the 2002 Japanese psychological horror movie of the same name. And yes, Dark Water is very dark, both the Japanese and American version. If you've watched the Japanese version, you won't be disappointed with this remake. This can be considered as one of the successful remakes. As I've mentioned earlier on, good psychological movies will give you ample doses of darkness, eeriness, and fear till you couldn't sit still. And that's what Dark Water is also capable of.